Students at Columbia University’s Barnard College came out overwhelmingly in favor of their school divesting from companies that profit from Israeli apartheid. Of the 1,153 students that voted in the school-wide referendum, 64.3 percent voted in favor, according to the final count of April 18. The referendum, proposed by Columbia University Apartheid Divest, was the conclusion of over two years of sustained struggle by Palestine solidarity activists to build support for the movement to Boycott, Sanction and Divest from Israel on the Columbia and Barnard campuses in New York City. A gag rule targeting BDS organizing and pro-Palestine speech had also been introduced in the U.S. Congress. If voted into law, it would punish companies, organizations, and their employees, for participating in or even informing people about BDS with up to $1 million in fines as well as jail time. Censorship by students and administrators is not new for pro-Palestinian student activists on Columbia University and Barnard College’s campus. Two years after its founding, Students for Justice in Palestine (which launched CUAD alongside Jewish Voice for Peace in 2016) was suspended. In 2014, Barnard’s administration arbitrarily took down the group’s banner of a map of historic Palestine with the message “Stand for Justice, Stand for Palestine” under pressure from Zionist students and donors. Members of SJP have been intimidated and physically attacked by pro-Israel students, including Israeli Occupation Forces veterans, with no disciplinary action taken by the administration to protect their right to express their beliefs without fear. Only a week before the vote, SJP member Yasmeen Abdel-Majeed told Liberation News, Zionist students attempted to slander SJP for holding a rally against the massacre of unarmed Palestinians taking part in the Great March of Return, falsely claiming the rally was to protest Holocaust Remembrance Day, although the SJP rally took place before that day. 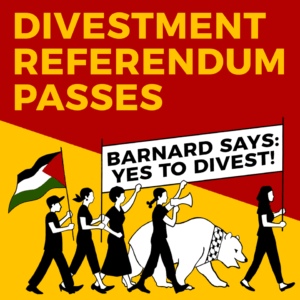 Because the referendum only triggers a letter of support from Barnard’s student government for BDS, the struggle to achieve divestment by the Board of Trustees is still ahead. The campaign is calling for divestment from eight companies: weapons manufacturers Lockheed Martin, Elbit Systems, and Boeing; Hewett Packard, which provides IT support for Israeli checkpoints and settlements; Hyundai Heavy Industries and Caterpillar, which provide the IOF with machinery to destroy Palestinian homes and build illegal settlements; Israeli water apatheid utility Mekorot and Bank Hapoalim which finances settlement construction. Students have used this divestment campaign to highlight the different ways that Israeli apartheid functions. They have helped build solidarity with student activists fighting for environmental justice, economic justice and an end to racist police violence and prisons (including the successful Prison Divest campaign which made Columbia the first University to divest from private prisons in 2015).